Bull kelp is the dominant kelp species along the coasts of Oregon and Washington. 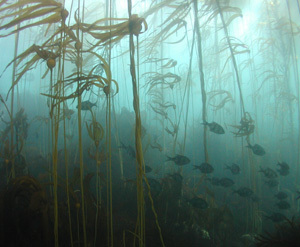 Kelp forests provide important habitat for fish and other marine life. Photo by Steve Clabuesch. All along the rocky coasts of the Pacific Northwest, grapefruit-sized shrunken heads bob in the jade-green swirls of surf. They belong to bull kelp, a giant seaweed that spreads glistening brown fronds across the water, sheltering dozing sea otters. In winter storms, the plants' 60-foot-long stems rip loose from the sea floor and wash ashore like abandoned rigging. A common sight north of Santa Cruz, bull kelp (Nereocystis luetkeana) is the most abundant kind of kelp in Oregon, Washington, British Columbia, and Alaska. Its cousin, giant kelp (Macrocystis species), predominates to the south. Both of these kelps are known for being rapid growers, sometimes adding a foot or more of new foliage per day. This copious production has made kelp popular among commercial harvesters, who use knives or mechanical mowers to trim the top four feet or so from the plant. Kelp was prized early on as an ingredient in glassmaking, and extracts are now widely used in foods, cosmetics, fertilizers, agricultural feeds, and alternative medicines. To date, the great majority of harvesting has been directed at giant kelp, which tends to grow in warmer, more placid waters. The more streamlined bull kelp tends to grow in stronger currents and in waters exposed to high surf, where harvesting is difficult or dangerous. But as demand grows for kelp extracts, harvesters may begin to target bull kelp. If so, there may be cause for concern, according to biologists at the University of California, Santa Cruz. "We don't know much about bull kelp, but we do know it is very different from giant kelp. We should proceed with caution," said Yuri Springer, a former postdoctoral researcher at UCSC. Springer, who is now with the California Department of Public Health, was lead author of a recent review of bull kelp in North America that summarized scientific studies, harvesting records, and existing laws. In addition to Springer, the study's authors include Mark Carr, professor of ecology and evolutionary biology at UCSC; former UCSC postdoctoral researcher Cynthia Hays; and Megan Mackey of the Pacific Marine Conservation Council. Their report highlighted important differences between giant kelp and bull kelp, including giant kelp's ability to live for several years and grow fronds along its whole length--a feature that helps it shrug off the effects of harvesting. By contrast, bull kelp plants usually die each winter and start again as sprouts in the spring. If they're cut near the floating head--technically, the "pneumatocyst"--the plant won't grow back and, depending on the time of year, won't have a chance to release its spores, from which new plants grow. Over time, this could shrink the whole kelp patch. "Scuba diving in a giant kelp forest, it's difficult to swim between plants because you get tangled up in all the fronds. Whereas bull kelp looks like a forest of hundreds of bare stems rising up to the surface," Springer said. Fortunately, commercial interest is still low and harvesting regulations are reasonably strict in most states, notably California and Washington. Alaska, Washington, Oregon, California, and British Columbia combined have issued a total of 20 permits to harvest bull kelp and have recorded less than 350 tons of harvested bull kelp per year, according to the report. By comparison, about 52,000 tons of giant kelp were harvested in California alone in 2006, according to the National Marine Fisheries Service, down from peak harvests of more than 170,000 tons per year in the 1970s. Oregon is the most lenient state. It sets no limits on bull kelp harvest, although at present only one commercial harvester is registered. In addition to commercial harvest, personal harvest is allowed in all states and largely goes unreported. Springer said that better record keeping would be very useful in determining baseline knowledge about bull kelp, in case commercial harvesting does take off. He also urged states to work together to arrive at consistent harvest regulations. "You can cross the Washington-Oregon border--it's just an invisible line in the water--and suddenly the harvesting regulations are very different. There's no biological rhyme or reason for that. It would be nice if the regulations had more biological meaning," he said. Springer's report was funded by the Lenfest Ocean Program, established in July 2004 by the Lenfest Foundation at the Pew Charitable Trusts. The organization supports research in ocean sciences, particularly fisheries, with an emphasis on formulating policy-relevant solutions to ocean problems. The report is available from the Lenfest Foundation web site. Note to reporters: You may contact Springer at (510) 620-3189 or yurispringer@gmail.com and Carr at (831) 459-3958 or carr@biology.ucsc.edu.